Objectives: To investigates the mucoprotective effect of genistein on gastric injury in rats with indomethacin (IMN)-induced gastropathy. Methods: Male Sprague-Dawley rats were randomly divided into three groups. Group 1 (control; n = 6) was given distilled water (DW). Group 2 (IMN; n = 6) was given indomethacin (IMN) 150 mg/kg dissolved in 5% sodium bicarbonate (NaHCO3-) 1 mL/rat via intragastric tube at time 0 and 4 h. Group 3 (genistein; n = 6) was given genistein 100 mg/kg dissolved in 0.1% dimethyl sulfoxide (DMSO) plus IMN 150 mg/kg at time described as group 2. Four hours after the second dose, the stomach was removed to examine iNOS western blot expression, malondialdehyde (MDA), and histopathologic examination. Serum was collected to determine TNF-alpha and prostaglandin E2(PGE2) levels using ELISA technique. Results: Tissue MDA and serum TNF-alpha were significantly increased in the IMN group, as compared to the control group (9.70 ± 0.40 vs. 1.56 ± 0.14 nmol/mg protein, P = 0.000; 210.28 ± 0.98 vs. 126.4 ± 0.13 pg/mL, P = 0.000, respectively) and decreased in the genistein group when compared to the IMN group (2.87 ± 0.37 vs. 9.70 ± 0.40 nmol/mg protein, P = 0.000; 156.59 ± 0.10 vs. 210.28 ± 0.98 pg/mL, P = 0.000, respectively). 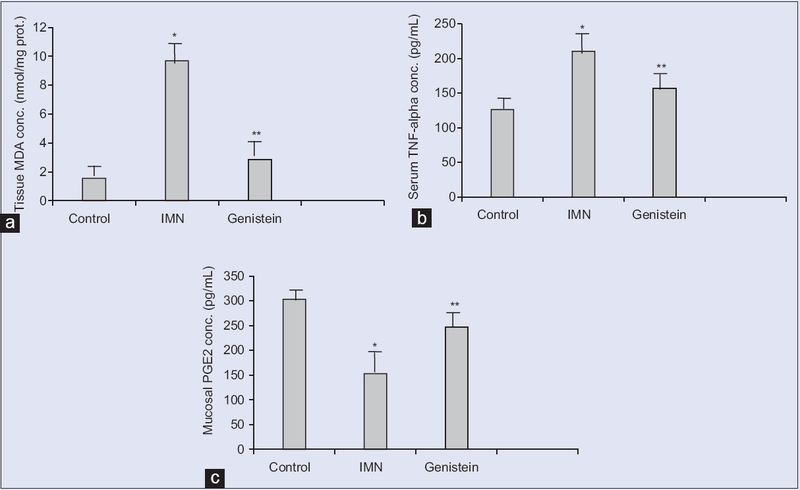 Serum PGE2level in IMN group was decreased significantly compared with control group (152.83 ± 0.10 vs. 303.33 ± 2.16 pg/mL, P = 0.000) and increased in the genistein group compared to the IMN group (247.65 ± 0.01 vs. 152.83 ± 0.10 pg/mL, P = 0.000). Expression of tissue iNOS was increased in the IMN group and improved in genistein groups. Most of the rats in the IMN group developed moderate to severe gastric erosion and ulcers. Gastric erosions and neutrophil infiltration score were significantly decreased in the genistein group. Conclusions: Genistein attenuated IMN-induced gastropathy in rats by reducing inflammation, decreasing oxidative stress, restoring mucoprotective function, and improving gastric histopathology. Abbreviations used: NSAIDs: Non-steroidal anti-inflammatory drugs; IMN: Indomethacin; COX: Cyclooxygenase; TNF: Tumor necrosis factor; ICAM: Intercellular adhesion molecule; iNOS: Inducible nitric oxide synthase; MDA: Malondialdehyde; CINC: Cytokine-induced neutrophil chemoattractant. This is an experimental study of the effect of NSAIDs in gastropathy. This study demonstrated the efficacy of genistein in treatment of NSAIDs-induced gastropathy. Genistein efficacy is reflected in the attenuation of histological alterations, with improvement in key biological parameters involved in the pathogenesis of NSAIDs gastropathy. Flavonoids and phenolic compounds can be found in many edible plants, for instance, the leafy vegetables, fruits, and plant-based beverages. Flavonoids are categorized into five classes, the flavone, isoflavone, flavonol, flavanone, and anthocyanin. These compounds seem to have many beneficial biological effects including anti-inflammatory, antioxidant, antihistaminic, free radical scavenging abilities, antiviral, antithrombotic, and anti-ischemic effects. Some abilities of flavonoids have preferable outcomes on gastritis, gastric ulcer, and even gastric cancer. The known mechanisms of this gastroprotective effects of flavonoids are the increase of endogenous prostaglandin, reduction of histamine secretion, scavenging of oxygen-derived free radicals, stimulation of gastric mucus secretion, and inhibition of “nuclear factor-κB” (NF-κB) and “signal transducer and activator of transcription-1” (STAT-1)., NF-κB and STAT-1 are the main factors of NO production as they play a role of transcription factors for iNOS. Flavonoid compounds (including genistein) are observed to decrease lipopolysaccharide-induced NO production on J774 macrophage, decrease iNOS protein expression, and decrease iNOS mRNA levels. Genistein, one of the flavonoids, isoflavone, is generally found in soybean. Genistein has various abilities including estrogen-like activity, anti-inflammatory, antioxidant, and anticancer effects. Genistein has similar structure to estradiol. Genistein binds to the estrogen receptor at the estrogen-responsive tissue. However, genistein may produce an antagonistic effect of estrogen as genistein is a weak estrogen agonist., The other effects of genistein as mentioned above can be seen in the previous research. 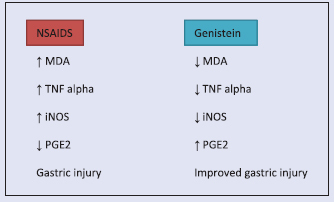 Genistein can lead to gastroprotective ability as it seems to reduce gastric acid secretion and suppress TNF-alpha and cytokine-induced neutrophil chemoattractant (CINC)-1, which are inflammatory cytokines related to gastric ulceration. There are many researches that confirm the gastroprotective effect of genistein, but unfortunately, there have not yet been research on the effect of genistein on NSAIDs-induced gastropathy. This study aims to test the gastroprotective properties of genistein on inflammatory attenuation, oxidative stress reduction, and improvement of histopathology in rats with IMN-induced gastric injury. The protocol for this study was approved by the Institutional Review Board of the Faculty of Medicine, Chulalongkorn University (Approval No. 17/2557). Eighteen male Sprague-Dawley rats weighing 180–220 g that were purchased from the National Laboratory Animal Center, Mahidol University, Salaya Campus, Nakornpathom, Thailand, were used in this study. All rats were kept in a controlled temperature room at 25°C ± 1°C under standard conditions with a 12-h light/12-h dark cycle. Care for animals in this study complied with the rules and regulations set forth by the Chulalongkorn University Animal Care and Use Committee. IMN, which is an NSAID, was dissolved in 5% NaHCO3− (Atlantic Laboratories Corp., Ltd., Bangkok, Thailand). Genistein (Cayman Chemical, Ann Arbor, MI, USA) was dissolved in 0.1% dimethyl sulfoxide (DMSO) (Sigma-Aldrich Co. LLC., St. Louis, MO, USA). All rats were fasted with water available ad libitum for 22–24 h before the experiment. Rats were randomly divided into three experimental groups. Group 1 (control; n = 6) was given distilled water 1 mL/rat through intragastric tube at 0 and 4 h. Group 2 (IMN; n = 6) was given IMN 150 mg/kg dissolved in 5% sodium bicarbonate (NaHCO3−) 1 mL/rat through intragastric tube at 0 and 4 h as previously described., Group 3 (genistein; n = 6) was given genistein 100 mg/kg dissolved in 0.1% DMSO and IMN 150 mg/kg dissolved in 5% NaHCO3− 1 mL/rat through intragastric tube at 0 and 4 h.
Four hours after the second dose (total elapsed time 8 h), all rats were anesthetized with an intraperitoneal injection of thiopental sodium 50 mg/kg (Jagsonpal Pharmaceuticals Limited, Haryana, India). The stomach of each rat was removed and dissected along the greater curvature. Stomach specimens were then washed twice with ice-cold phosphate-buffered saline, frozen in liquid nitrogen, and stored at −80°C until laboratory evaluation for the expression of iNOS using Western blot (Abcam Plc., Cambridge, MA, USA) and for MDA using TBARS Assay Kit (Cayman Chemical, Ann Arbor, MI, USA). 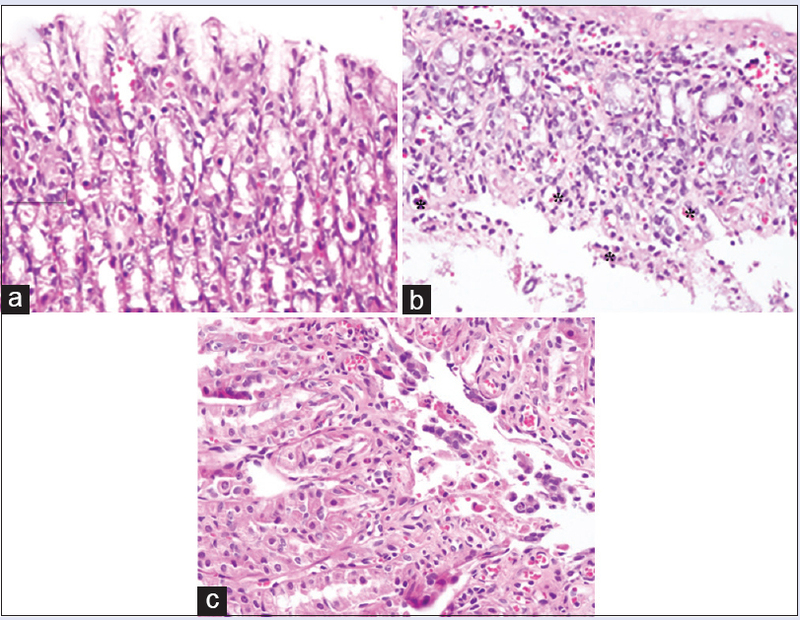 The remaining stomach specimens were fixed in 10% formalin solution, which was later stained with hematoxylin and eosin (H and E) for histopathologic examination of pathologic change of gastric mucosa, as measured by ulcer index. A blood sample was then collected by cardiac puncture. The blood was allowed to clot at room temperature for 2 h before being centrifuged at 1000 g for 20 min. Serum was separated and stored at −80°C until measurement of TNF-alphaa and PGE2 levels using enzyme-linked immunosorbent assay (R&D Systems, Inc., Minneapolis, MN, USA). Stomach tissue samples were excised and fixed in 10% formalin and later processed by routine technique before paraffin embedding. Sections were cut into 5 μm thickness and stained with H and E stain. One experienced gastrointestinal pathologist (NK) examined all blinded samples using light microscopy with ×40 magnification. All histopathological findings were recorded and graded using gastric erosion and polymorphonuclear (PMN) leukocyte infiltration scores, as follows: gastric erosion: 0, no erosion; 1, erosion 1/3rd of epithelium depth; and 2, erosion 2/3rd of epithelium depth, or development of ulcer. For PMN infiltration: 0, no infiltration (normal/no gastric mucosal injury); 1, PMN infiltration 1/3rd of epithelium (mild injury); 2, PMN infiltration 2/3rd of epithelium (moderate injury); and 3, PMN infiltration in all depths of epithelium (severe injury). All data are presented as mean ± standard deviation. Means were compared by one-way analysis of variance (one-way ANOVA), followed by Fisher's least significant difference post hoc test. All statistical analyses were performed using SPSS for Windows version 22.0 (SPSS, Inc., Chicago, IL, USA). P <0.05 was considered statistically significant. Level of gastric MDA was significantly higher in the IMN group than in the control group (9.70 ± 0.40 vs. 1.56 ± 0.14 nmol/mg protein, P = 0.000). There was a significant decrease in gastric MDA level in the genistein group, as compared with the IMN group (2.87 ± 0.37 vs. 9.70 ± 0.4 nmol/mg protein, P = 0.000). Mean serum MDA levels for all groups are shown in [Figure 1]a and [Table 1]. Average concentrations of serum TNF-alpha were markedly increased in the IMN group, when compared with the control group (210.28 ± 0.98 vs. 126.4 ± 0.13 pg/mL, P = 0.000). There was a significant decrease in gastric TNF-alpha level in the genistein group, as compared with the IMN group (156.59 ± 0.10 vs. 210.28 ± 0.98 pg/mL, P = 0.000). Mean serum TNF-alpha levels for all groups are shown in [Figure 1]b and [Table 1]. Level of serum PGE2 was significantly decreased in the IMN group, as compared with the control group (152.83 ± 0.10 vs. 303.33 ± 2.16 pg/mL, P = 0.000). There was a marked increase in serum PGE2 level in the genistein group, as compared with the IMN group (247.65 ± 0.01 vs. 152.83 ± 0.10 pg/mL, P = 0.000). Mean serum PGE2 levels for all groups are shown in [Figure 1]c and [Table 1]. Compared with the control group, iNOS band intensity in the IMN group increased. 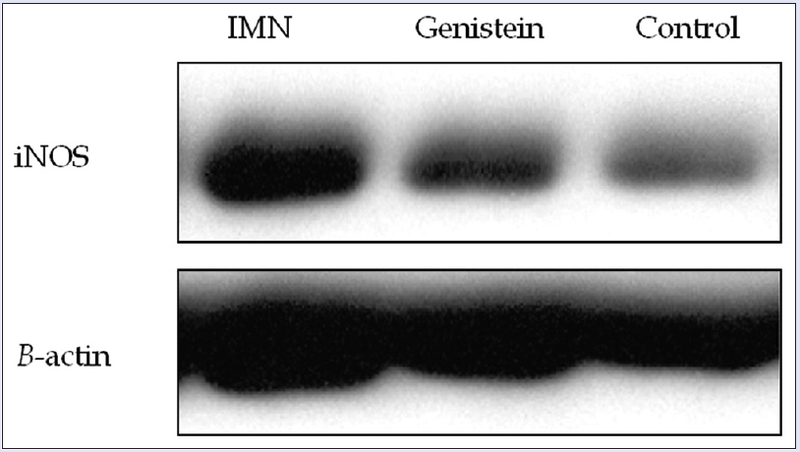 Expression of iNOS band intensity declined in the genistein group, when compared with the IMN group. Band intensity representing iNOS and β-actin is shown in [Figure 2]. Histologic appearance of the stomach in control group rats [Figure 2] was normal. In the IMN group, four rats developed gastric erosion (score 2) and two rats developed gastric ulcer. PMN infiltration scores in the IMN group were as follows: four rats had a score of 1 and two rats had a score of 0. In the genistein group, stomach histopathology improved both gastric erosion and PMN infiltration, when compared to the IMN group. No gastric ulcer was found in the genistein group, as shown in [Figure 3] and [Table 2]. In this research, we study the effects of genistein on IMN-induced gastropathy in rats. It can be seen that the anti-inflammatory effect of genistein helps prevent the formation of gastric ulcer induced by IMN. Recent studies have shown that the early and significant pathogenesis of NSAIDs-induced gastropathy presents with leukocyte adhesion to the vascular endothelium which results in tissue inflammation. As mentioned above, NSAIDs decrease the PGE2 level which causes an elevation of TNF-alpha. TNF-alpha, a pro-inflammatory cytokine, plays an important role in the expression of iNOS or Type II NOS. iNOS is the main enzyme in NO production. NO is another significant mediator of inflammation. It leads to tissue injury. Furthermore, TNF-alpha stimulates the ICAM-1 expression on the endothelium. ICAM-1 directly relates to an increase of neutrophil adhesion. ICAM-1 also induces transendothelial migration of leukocytes to the inflamed tissue which also results in more tissue damage. In addition, TNF-alpha stimulates NF-κB. NF-κB causes gastric injury through various pathways. First, NF-κB increases inflammatory cytokine synthesis such as IL-1, IL-6, and IL-8 and increases these inflammatory cytokine receptors. Second, NF-κB regulates adhesion molecule such as ICAM-1 expression. Neutrophil accumulation and adhesion stimulated by various inflammatory cytokines will lead to tissue damage. Therefore, substance that reduces the adhesion molecule will attenuate the inflammatory process. From a previous study, it was found that administration of monoclonal antibody against endothelial adhesion molecules can help prevent the IMN-induced neutrophil adhesion and consequently decrease the severity of IMN-induced gastric injury. Recent studies have revealed that genistein has anti-inflammatory effect which results in positive outcome in gastric injury. Genistein inhibits tyrosine-specific protein kinase activity of epidermal growth factor receptor which results in the suppression of NF-κB activity, inhibition of TNF-alpha production in monocytic macrophage cell lines in vitro, and also inhibition of CINC-1 or IL-8., Genistein has direct gastroprotective effect as it suppresses gastrin secretion. The decrease in gastrin leads to decrease in gastric acid secretion. There has been an investigation in the other research on anti-inflammatory effect of genistein. The doses of 50 and 100 mg/kg/day genistein were given to water immersion restraint-stressed Wistar rats for 2 weeks. These rats receiving genistein had less ratio of mucosal hemorrhagic erosion area to the whole stomach body area; decreased pro-inflammatory cytokines, including decreased TNF-alpha and CINC-1 level in gastric tissue; decreased myeloperoxidase activity; increased superoxide dismutase activity; and decreased TBARS level (an index of lipid peroxidation that is expressed as nmol of MDA). Another mechanism of genistein is it reduces iNOS resulting in decreased NO. It has been studied that low-dose genistein attenuates immunohistochemical staining for iNOS leading to reduction of peroxynitrite synthesis and improves mucosal architecture. In this research, administration of 150 mg/kg body weight of IMN shows significantly higher level of tissue MDA (a metabolite of intracellular lipid peroxidase), serum TNF-alpha (a pro-inflammatory cytokine), and tissue iNOS (an inflammatory modulator) compared with the control group. In addition, the level of all these three substances significantly decreased in genistein pretreated group compared with IMN group. The result shows that IMN group causes a decrease in mucosal PGE2(a mucoprotective factor of the stomach) compared with the control group. On the other hand, in genistein group, the level of PGE2 raises significantly as compared to the IMN group. 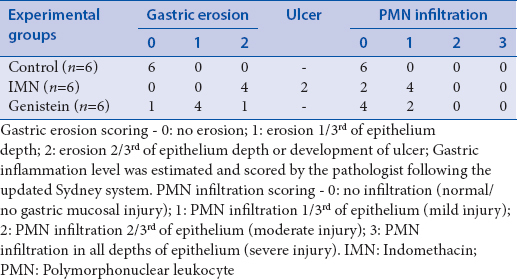 Moreover, the IMN group causes more gastric erosions and ulcer formation with increase in PMN infiltration around the gastric lesions, while the group given genistein as a prophylaxis reveals improved gastric histopathology including the gastric erosion severity and PMN infiltration score compared to the IMN group. NSAIDs cause an increase in inflammatory cytokines and leukocyte adhesions leading to gastric mucosal damage in the form of erosion or ulcer. Genistein, an isoflavone with its gastroprotective abilities, can attenuate IMN-induced gastric injury by reducing inflammation and oxidative stress and improving the gastric histopathology. Therefore, according to the results collected in this study, genistein should be considered as a preventive method for NSAIDs-induced gastropathy. This study was financially supported by the National Research Council of Thailand, Bangkok, Thailand. Wolfe MM, Lichtenstein DR, Singh G. Gastrointestinal toxicity of nonsteroidal antiinflammatory drugs. N Engl J Med 1999;340:1888-99. Becker JC, Domschke W, Pohle T. Current approaches to prevent NSAID-induced gastropathy – COX selectivity and beyond. Br J Clin Pharmacol 2004;58:587-600. Hawkey CJ. Nonsteroidal anti-inflammatory drug gastropathy. Gastroenterology 2000;119:521-35. Wallace JL. Nonsteroidal anti-inflammatory drugs and gastroenteropathy: the second hundred years. Gastroenterology 1997;112:1000-16. Takeuchi K. Pathogenesis of NSAID-induced gastric damage: importance of cyclooxygenase inhibition and gastric hypermotility. World J Gastroenterol 2012;18:2147-60. Santucci L, Fiorucci S, Giansanti M, Brunori PM, Di Matteo FM, Morelli A. Pentoxifylline prevents indomethacin induced acute gastric mucosal damage in rats: role of tumour necrosis factor alpha. Gut 1994;35:909-15. Spatafora M, Chiappara G, D'Amico D, Volpes D, Melis M, Pace E, et al. Effect of indomethacin on the kinetics of tumour necrosis factor alpha release and tumour necrosis factor alpha gene expression by human blood monocytes. Pharmacol Res 1991;23:247-57. Wallace JL, Keenan CM, Granger DN. Gastric ulceration induced by nonsteroidal anti-inflammatory drugs is a neutrophil-dependent process. Am J Physiol 1990;259 (3 Pt 1):G462-7. Wallace JL, Arfors KE, McKnight GW. A monoclonal antibody against the CD18 leukocyte adhesion molecule prevents indomethacin-induced gastric damage in the rabbit. Gastroenterology 1991;100:878-83. Rothlein R, Czajkowski M, O'Neill MM, Marlin SD, Mainolfi E, Merluzzi VJ. Induction of intercellular adhesion molecule 1 on primary and continuous cell lines by pro-inflammatory cytokines. Regulation by pharmacologic agents and neutralizing antibodies. J Immunol 1988;141:1665-9. Appleyard CB, McCafferty DM, Tigley AW, Swain MG, Wallace JL. Tumor necrosis factor mediation of NSAID-induced gastric damage: role of leukocyte adherence. Am J Physiol 1996;270 (1 Pt 1):G42-8. Rainsford KD. Microvascular injury during gastric mucosal damage by anti-inflammatory drugs in pigs and rats. Agents Actions 1983;13:457-60. Takeuchi K, Satoh H. NSAID-induced small intestinal damage – Roles of various pathogenic factors. Digestion 2015;91:218-32. Colucci R, Fornai M, Antonioli L, Ghisu N, Tuccori M, Blandizzi C, et al. Characterization of mechanisms underlying the effects of esomeprazole on the impairment of gastric ulcer healing with addition of NSAID treatment. Dig Liver Dis 2009;41:395-405. Jung J, Nam Y, Sohn UD. Inhibitory effects of ECQ on indomethacin-induced gastric damage in rats. Korean J Physiol Pharmacol 2012;16:399-404. Gottstein N, Ewins BA, Eccleston C, Hubbard GP, Kavanagh IC, Minihane AM, et al. Effect of genistein and daidzein on platelet aggregation and monocyte and endothelial function. Br J Nutr 2003;89:607-16. Marcial G, Rodríguez C, Medici M, de Valdez GF. New approaches in gastritis treatment, gastritis and gastric cancer. In: Tonino P, editor. New Insights in Gastroprotection, Diagnosis and Treatments. Croatia - EUROPEAN UNION: InTech Publisher; 2011. p. 153-76. DOI: 10.5772/23221. Takekawa S, Matsui T, Arakawa Y. The protective effect of the soybean polyphenol genistein against stress-induced gastric mucosal lesions in rats, and its hormonal mechanisms. J Nutr Sci Vitaminol (Tokyo) 2006;52:274-80. Santell RC, Chang YC, Nair MG, Helferich WG. Dietary genistein exerts estrogenic effects upon the uterus, mammary gland and the hypothalamic/pituitary axis in rats. J Nutr 1997;127:263-9. Folman Y, Pope GS. The interaction in the immature mouse of potent oestrogens with coumestrol, genistein and other utero-vaginotrophic compounds of low potency. J Endocrinol 1966;34:215-25. Thong-Ngam D, Choochuai S, Patumraj S, Chayanupatkul M, Klaikeaw N. Curcumin prevents indomethacin-induced gastropathy in rats. World J Gastroenterol 2012;18:1479-84. Werawatganon D, Rakananurak N, Sallapant S, Prueksapanich P, Somanawat K, Klaikeaw N, et al. Aloe vera attenuated gastric injury on indomethacin-induced gastropathy in rats. World J Gastroenterol 2014;20:18330-7. Dixon MF, Genta RM, Yardley JH, Correa P. Classification and grading of gastritis. The updated Sydney System. International Workshop on the Histopathology of Gastritis, Houston 1994. Am J Surg Pathol 1996;20:1161-81. Wallace JL, McKnight W, Miyasaka M, Tamatani T, Paulson J, Anderson DC, et al. Role of endothelial adhesion molecules in NSAID-induced gastric mucosal injury. Am J Physiol 1993;265 (5 Pt 1):G993-8. Witko-Sarsat V, Rieu P, Descamps-Latscha B, Lesavre P, Halbwachs-Mecarelli L. Neutrophils: molecules, functions and pathophysiological aspects. Lab Invest 2000;80:617-53. Konturek PC, Duda A, Brzozowski T, Konturek SJ, Kwiecien S, Drozdowicz D, et al. Activation of genes for superoxide dismutase, interleukin-1beta, tumor necrosis factor-alpha, and intercellular adhesion molecule-1 during healing of ischemia-reperfusion-induced gastric injury. Scand J Gastroenterol 2000;35:452-63. Lazzaroni M, Bianchi Porro G. Gastrointestinal side-effects of traditional non-steroidal anti-inflammatory drugs and new formulations. Aliment Pharmacol Ther 2004;20 Suppl 2:48-58. Zamora R, Vodovotz Y, Billiar TR. Inducible nitric oxide synthase and inflammatory diseases. Mol Med 2000;6:347-73. Sadowska-Krowicka H, Mannick EE, Oliver PD, Sandoval M, Zhang XJ, Eloby-Childess S, et al. Genistein and gut inflammation: Role of nitric oxide. Proc Soc Exp Biol Med 1998;217:351-7.